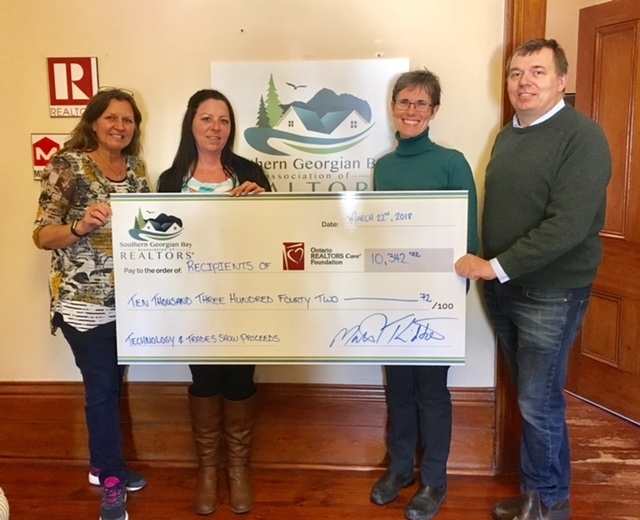 The Southern Georgian Bay Association of REALTORS® recently hosted a REALTOR® Technology & Trades Show at the Blue Mountain Village Conference Centre. In addition to top real estate performers and industry experts presenting their insights and expertise on a variety of technology related topics, the show was sold out with 66 exhibitors showcasing their products and services to an estimated 250 REALTORS®. Terry O’Reilly, Author and CBC Radio host of ‘Under the Influence’, was on hand to share some of his advertising and marketing wisdom and to sign copies of his latest bestseller, This I Know: Marketing Lessons from Under the Influence. SGBAR would like to thank their Trades Show sponsors: Century 21 Millennium Inc., CENTUM Alternative Mortgages Ltd., Mortgage Wellness and the Appraisal Institute of Canada – Ontario Association. On behalf of the Members of the Southern Georgian Bay Association of REALTORS®, Matthew Lidbetter (President) presented proceeds from the event in the amount of over $10,300 to Home Horizon, Shelter Now, My Friend’s House and La Maison Rosewood Shelter (not pictured), through the Every REALTOR® Campaign of the Ontario REALTORS Care® Foundation. The Southern Georgian Bay Association of REALTORS® represents over 550 REALTORS® registered with its member offices. The geographical area served by the Association includes the Towns of Midland and Penetanguishene, the Townships of Tay and Tiny and parts of Severn and Georgian Bay Townships; Wasaga Beach, Clearview Township, Collingwood, The Blue Mountains and portions of the Municipality of Meaford and Grey Highlands.